And then what? FG is just up the road, so why not make that zone 2? Unless you have a flat fare system, then there has to be a boundary somewhere. It’s just unfortunate for locals that it’s Maryland. I suspect the only reason that the intermediate stations to Greenwich were changed was that it avoids the odd Z2 to Z2 via Z3 journey you’d have if they weren’t changed as well. 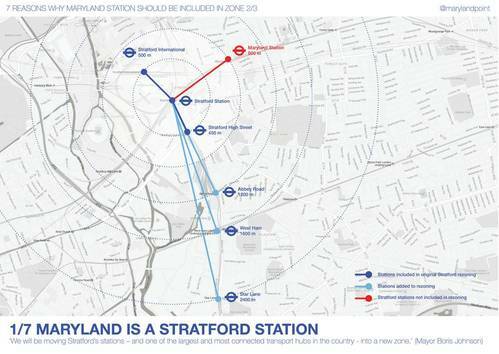 Measuring distances from Stratford is a very strange way of looking at it, just because Maryland is closer to Stratford than Star Lane is not a reason to change it’s zone. If you look at distances from Charing Cross, (picked for no real reason as it’s fairly central and used for roads) then Maryland is further away than all the rezoned 2/3 stations so it’s not like you’ve got a Zone 3 station further in than Zone 2. It is time to get rid of London Underground zones. They have an ill effect on house prices, those within Zone 2 where higher which fell into Zone 3.